Lower Washington St. at Walnut St. Looking east with Walnut St. coming in from the right. Partial view of the Brookline House, an eating establishment started by Aaron Whitney circa 1865. Built in 1892 for Benjamin Lombard Jr., a banker and real estate executive. The Lombards moved to 349 Coomonwealth Ave. circa 1905 and King Gilette, the inventor of the modern razor blade, bought the house circa 1907 and lived there until 1913. The house was torn down in 1944. Northwest corner of Washington and Thayer. House of Martin Kingman from 1866 to 1913, when it was demolished. Looking east on Beacon, standing at today's Strathmore Rd. Englewood Ave enters on the left. From the 1887 photo series taken just before the widening of Beacon St.
Long time residence and business location of Jonathan Dean Long (1819-1889), carpenter and builder, roughly across the street from the library. He was also listed in the town directory as a horticulturist and there is a sign advertising “Plants And Flowers For Sale “ in front of the house. The people pictured here do not seem to match those in Long’s family. Standing on the corner of Walnut St. and High St. looking northeast towards Lower Washington St. Left, on High St., is the rear of Henry J. Pineo, Carpenter and Builder. On the corner, with Walnut St. going to the right, are several outbuildings of Michael W. Quinlan, Carriages and Harnesses, whose main business is off screen to the left, on the corner of Boylston St. and High St. Standing on today's Rt.9. To the left is the corner of Hose House #1 and Chemical Engine #1. To the right of that, also on Lower Washington St. is P. J. Burns, Horse Shoe Forge. On the upper right, are the High St. businesses of George M. and Thomas K. Forster, Upholsterer and Henry J. Pineo, Carpenter and Builder. Istanding On Boylston St., looking east on Lower Washington St. Identifiable on the left are the variety store of Albert Leviens and the provisions store of Thomas S. Brown. Across from Winthrop Rd., around today's #1680 Beacon St.
Morris Salis started his tailor shop here in 1903 and remained for two decades. Sharing #289 is Charles Lot James, Real Estate. Gertrude F. Wallace was a hairdresser in the building to the right, #285 (still standing in modified form), until 1908-9. Harvard Square is a few steps to the right. These businesses were together at this location from 1909/1910 to 1916. Morris Salis, tailor, and Louis Ianneville, shoe repair, were at 289 Washington St. while Thomas F. Thompson, painter, was at #287. Harvard Square is a few steps to the right. The focus of this photo is the residence and business of Gertrude F. Wallace, hairdresser, at 285 Washington St. But the other structures to the right provide a rare documentation of the demoltion of Harvard Hall in preparation for the erection of the building that is there today at the apex of Harvard and Washington streets.There is a workman on the roof of the just-closed furniture and upholstery business of Nelson C. Thompson. To the right of that, somewhat telescoped in size, is the Harvard Hall building housing two grocers and in the distance is the corner of the National Bank building. This photo most likey shows the final stage of the building at 11-13 Harvard Square. On the left,with its delivery wagons parked out front, is T. H. Dyer, Provisions. On the right, at #13 Harvard Sq., is Frank F. Seamens, Groceries. It appears that Lucius N. Danforth, a clerk at the Dyer store for two decades and at the George Joyce store there before that, has taken over the store. But the Danforth store will be short-lived: the building that exists today is about to be constructed there with Rhodes Bros. taking over occupancy. The one-story building, still standing in the center of the complex known as the "Rooney Block", houses Henry Collins & Co., Provisions. To the right, the store of Mayo & Paine Stoves became, circa 1883, the Paine Brothers when Mr. Mayo left the business and Henry K. Paine went into business with his brother, Isaac. The store of James Rooney, Boots and Shoes, is on the far right. 219 Washington St. from approx. 1879 - 1885, His brother, Eugene, was a clerk in the store. Inbound side of Beacon St. at Coolidge Corner. [right to left] Boulevard Trust at 1319 Beacon St.; Frank W. Russell, Real Estate, at 1315 Beacon St.; Charles Stearns' house; a glimpse of the storefront at 1299 Beacon St. housing real estate brokers; the steeple of the Second Unitarian Society Parish House at 11 Charles St. (still standing); the house of George W. Wightman at 3 Charles St.
Also shown is the trolley for route #940 which was essentially the forerunner to the "C" line. A four-room school house that opened in April 1888. Named after J. Eliot Cabot, a Brookline architect and one-time school committee member. When the school on Harvard and Pleasant streets was closed for the 1888 widening of Beacon St., the students moved to the Cabot School. Torn down in 1957 for subsidized housing now on the site. 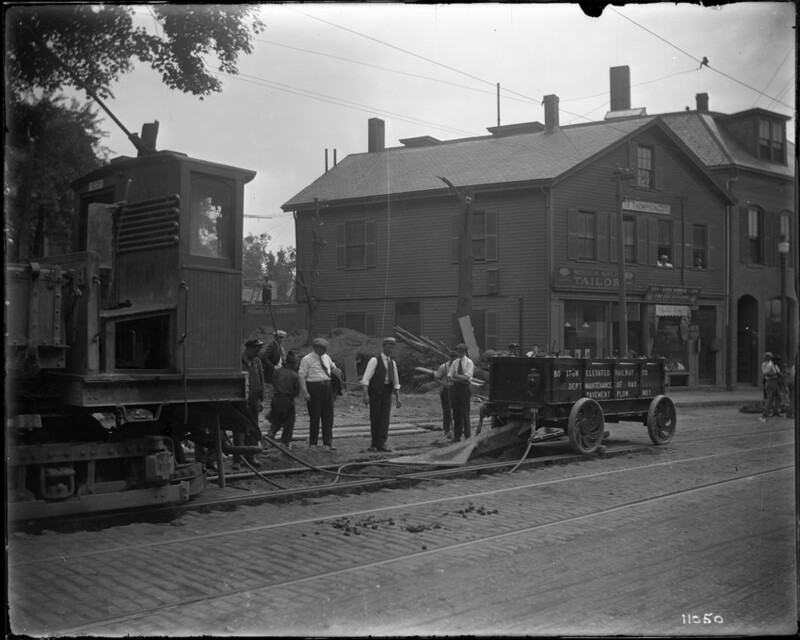 © 2016 Brookline Historical Society. All rights reserved.